This recipe makes enough salad for two people. However, if you’re smart, you will make double that amount if you are planning on having a plus one for dinner. I promise you you won’t want to share it. With anyone. No matter how much you like them. Sure, you might just have to play nice and slump some of this salad on their plates, but you’ll do it begrudgingly, and in the back or your head, you’ll kind of wish that it was just you and this salad. Alone. Together. Make just the amount below, and you’ll find yourself remembering my words here, regretting that you didn’t heed my warning. And eating should never be about regret. Which is why I am so glad to say (guiltily, of course!) that this salad, made for two, was mine – all mine. Each and every crunchy sliver. My solitary dinner never tasted so good. I was thinking, all the while ferociously chewing on a second helping, my goodness, what would I have done if I had to share it? And I’m actually really good at sharing. Especially food. But this, this one is tough. As I’m writing this, I sort of wish for a plateful at my side, but truthfully, I’d be too distracted to write. This is my perfect kind of salad, crunchy, spicy, and cold, made this during our July-long heatwave, when temperatures exceeded 100 degrees. I wanted something that would make for a great dinner side. When I saw Luisa wax poetic about kohlrabi, a little light went off in my head. I was thinking, I’ve eaten this before – kohlrabi – in Russia. And yet I couldn’t remember what specifically it was in. Or how it was cooked. My mother was of little help. When I asked her about us eating kohlrabi in the old country, she sent me a wikipedia article on what kohlrabi was. No mom, I emailed back, what is it that you made with it? She couldn’t remember either. And so it goes, a taste and a name so familiar, but foreign too, almost as if in a dream. So when I was peeling and cutting my kohlrabi, I decided to try a little bit on its own. It tasted just like the center part of the cabbage, which, growing up, was one of my favorite snacks. (It’s not lost on me that my favorite childhood snacks were vegetables – which officially makes me weird.) It’s hearty, firm, crunchy, and tastes a little of moist soil. It’s great in the summer raw, and, I imagine, in the colder months – braised in stews. Cutting it into matchsticks is a little tricky, so be sure to use a sharp knife, else you might be putting your fingers in danger. Or, if your matchstick skills could be improved upon, and you’re a tad lazy, like me, use a mandolin, if you have one. I sort of made this salad up as I went along. I was channeling green papaya salad, which is my favorite and something I can eat every day and not grow tired of, but there isn’t a single Thai place in my neighborhood that gets it just right, so I never wind up ordering it. I thought I’d make something similar, but with the ingredients on hand. And what a delicious experiment this was! I ate each tiny morsel, each fleck of the herbs. While the heat wave is over, for now, it will, undoubtedly, return in full force. We’ve quite a bit of the summer still left for us. The tomato season is arriving, the stone fruit is piled high at my farmers market; both are seductively fragrant. There’s still so much produce to cook and savor. So for the days when it’s scorching out again, this will be your antidote. Turn your a/c on and make this salad, doubling the amount, as instructed. Sit on your couch with your plus one, knees touching, or at your kitchen table, and pour yourself (and them) a chilled Riesling. This is summer at its best. Come to think of it, sharing is kind of nice. 1. 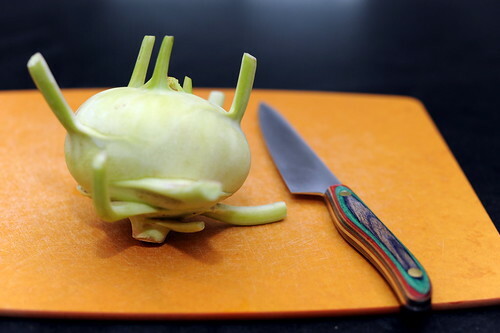 With a sharp knife, cut off the “branches” of the kohlrabi, peel it with a vegetable peeler. 2. Cut the kohlrabi into matchstick either using a sharp knife of a mandolin (I used the latter). Do the same with the apple. 3. 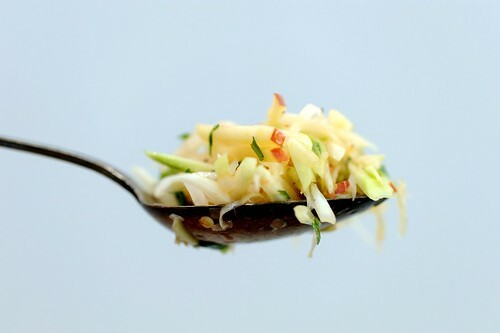 Toss the kohlrabi and the apple with the remaining ingredients and chill before eating. Wow such a cool looking vegetable! I will have to be on the look out for it the next time I am in the produce section. 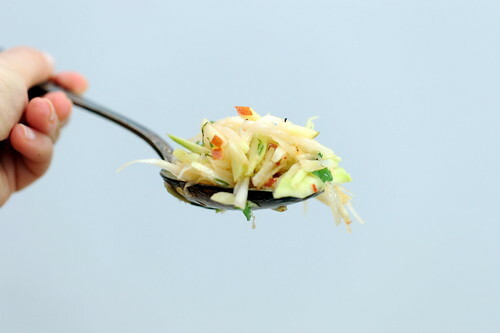 LOVE the idea of using kohlrabi for a papaya-salad type dish. Brilliant! Gorgeous photos, too! 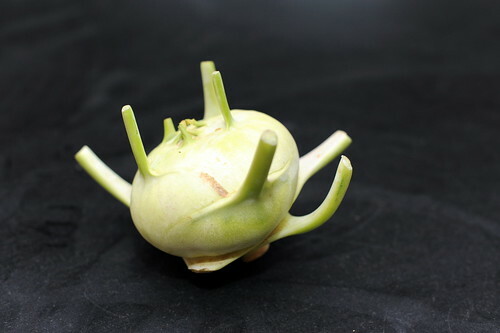 I don’t think I’ve ever tried kohlrabi…should pick it up at the grocery store next time. I kinda freaked last summer when I found kohlrabi in my CSA box. I just made soup with it. 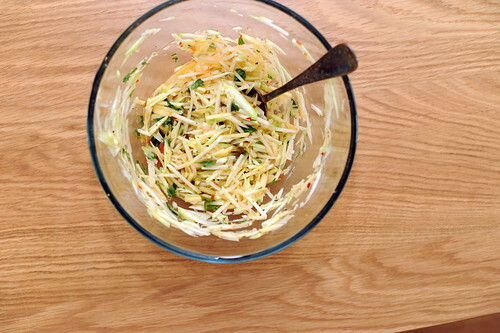 Now, I can’t wait until I find some so I can make this slaw. This looks yummy and refreshing! It would be a perfect picnic salad… kohlrabi salad, slice of watermelon, and iced tea? Perfect summer afternoon. Thanks! Anyway, the photos look absolutely gorgeous! I wish I could just grab the bowl of the salad from one of the pictures, just to try some! YUmm. Will have to pick up some kohlrabi, soon to try this! Thanks for the introduction to kohlrabi. I’m certain the two of us will become good friends – I love cabbage, so I’m sure I’m going to dig it. Fresh and crunchy. Just the way it should be. Great photo! gard sarnit, this is no salad! 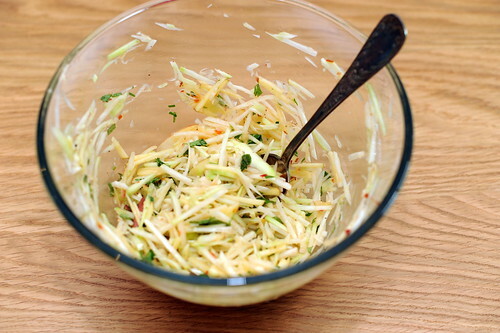 Rather it is a slaw. just tried this recipe and it turned out really well. on the first bite, i thought “mmm this is interesting” and then ended up devouring a giant bowl of this salad. thank you for sharing! definitely going to make this one again. It’s an awesome veggie! We ate them all the time as kids for snacks, just peeled & raw. Now, I’m so excited when I see them in the stor, I love to har with my kids! I just wish they’d grow we’ll in my region…. They don’t so ill settle for the seasonal treat. Peel, slice & enjoy!!! !